You don’t achieve what Paul Lawrie has at the top level in golf without self-belief. A major, two Ryder Cup appearances and seven regular European Tour titles isn’t bad going, after all, for someone who played off five when he turned professional and started off at the bottom of the ladder on the Tartan Tour. Throughout his glittering career – particularly after his 1999 Open Championship win at Carnoustie – the Aberdonian has felt capable of holding his own on the biggest stages in the game. And, boy, is he proud of what he has achieved, both on and off the golf course. With his 50th birthday on the horizon, though – he becomes a golden oldie on 1 January 2019 – Lawrie has suddenly been struck by a realisation that his best days are probably behind him on the European Tour. It’s more a case now of using events on that circuit this season so that he can hit the ground running on both the Champions Tour and Staysure Tour. 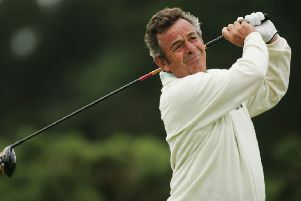 “Unfortunately, I see myself now in the twilight of my regular career,” he said, speaking at Gleneagles this week after being named along with Carly Booth as an ambassador for the inaugural European Golf Team Championships at the Perthshire venue in August. “Apart from the odd week, I’ve not been competitive for a wee while. “That’s come pretty quickly as even 18 months ago I felt I could win [as he did in the Dimension Data Pro-Am on the Sunshine Tour in South Africa]. But now I’m at the stage where making the cut is a half decent week and I never felt that would be the case. “You have to face up sometimes to the reality of it. Like everyone does, you wake up one day and get out of bed feeling stiff so competing with these young boys is tough. Man, watching Rory McIlroy hit the ball on Sunday [as he closed with a 64 to win the Arnold Palmer Invitational at Bay Hill]. These bunkers he’s taking it over. He’s hitting it 325 in the air without any bother. On Wednesday, Lawrie was playing in the North-East Alliance Championship at Newburgh. He uses that winter circuit to keep his game as sharp as possible. On a slightly different level, he’s excited about heading back to Carnoustie for this year’s Open but isn’t expecting to be a Claret Jug contender this time around at the venue that will forever be linked with his name. “Realistically, an event like The Open at Carnoustie is at a level that is probably a bit beyond me, even though I feel I can still contend the odd week on certain courses and that includes events on links courses,” he added. “While my mentality is never to go to a tournament just hoping to make the cut, that’s the reality of where I am at. He’ll be joining both Colin Montgomerie and Sandy Lyle in flying the Saltire on the US-based over-50s circuit. “I’m not fully exempt for the Champions Tour, but I think I have some sort of exemption,” continued Lawrie, who is still affected by foot trouble but has decided against a second visit to see a specialist in Germany after not seeing enough improvement from his initial trip. “They’ve changed a few of the the rules but we have spoken to the guy who runs it and he’s keen for me to play. I think they are quite keen to get some European major winners on the circuit, and it’s up to me to grab that opportunity when it comes along. “Playing between ten and 12 events over there would be my ideal schedule. I am still going to play a few main European Tour events and a few on the Staysure Tour as well. So come January I have a pretty cool schedule coming up. I don’t think it was Monty’s intention to play full time on the Champions Tour when he first went over there, but he loved it, played well and stayed. That might be the case for me or I might not like it. Only time will tell.